Horror vacui is a Latin expression that means fear of emptiness. In psychology, it can become a condition of the mind called cenophobia: the pathological fear of emptiness or void. Cenophobia derives from two Greek words: kenós, emptiness, and phobos, fear. Horror vacui has been experienced for centuries and throughout all human communication but has been accentuated at the end of the last century and the beginning of the twenty-first century. The baroque in eclecticism and postmodernism, and the hyperconnectivity of the Internet era have loaded the physical space and the ether of images, words, sounds and have led us to what philosopher Gillo Dorfles called “the (un)civilisation of noise” in his penultimate book. This phenomenon gives rise to hyperinformation, to the extent of being poisoning, toxic, not only in the art sphere but also in informative communication; the so-called “infoxication or information overload”. In everyday life there is also an increasing desire to photograph and record everything, to be constantly communicating everything in the culture of Instagram, snapchat, selfie, WhatsApp, Facebook. There is an unstoppable desire to produce and reproduce images in an unrestrained way, to keep everything: every image, every thought, every piece of information, not only by individuals but also companies, public bodies… They are all intent on classifying and storing data. In economics, this could easily be called overproduction. The surplus or the excess of rubbish seems to be the result of an overperformance of man, an excess of activity, of flight forward, of horror vacui. 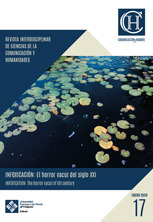 In this issue, we invite you to publish your thoughts about infoxication, but also about any phenomenon and human experience related to communication and the development of horror vacui.